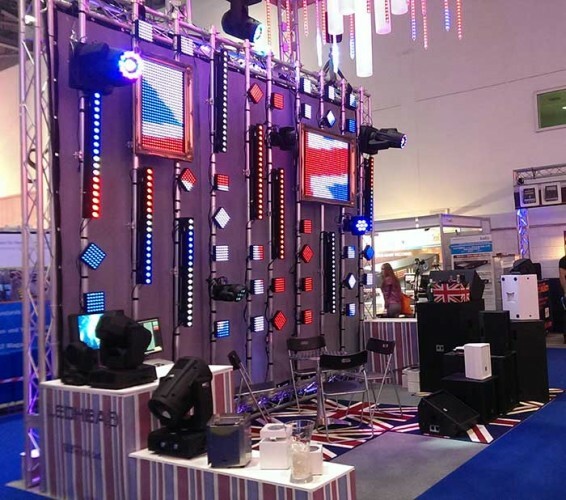 MilTec (UK) Ltd report that they had their busiest PLASA show for some years, due in part to their new Mini-Map miniature LED screens. All four days proved to be busy with inquiries from the UK, Europe and the rest of the world, with clients eager to learn more about the screens, along with all the other LED products in the MilTec range. The Mini-Map has 36 tricolour pixels, controlled via DMX512. Two versions are available- the touring module has PowerCon and 5-pin XLR connectors and an M10 fixing point. The installation module is a low-profile product, and comes with a backplate and IDC connectors for quick and easy fitting. The busy show has turned into a busy month with orders for Mini-Maps from the UK and Canada now being processed along with continued demand for the Batten2 LED batten. The Mini-Map screens are built by Miltec at their HQ in Kent, England. "We wanted to really make an impact in the new venue so we designed our stand so that every product could be pixelmapped to create a full 3D effect. We used screens, battens, moving heads and 3D tubes. Our friends at ShowCad supplied the control equipment and programmed the show," commented sales director David Faulkes. "We are very busy now, building products and organising demos all over the country".